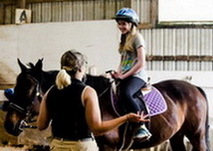 Your child and friends will spend time learning about horses, grooming and riding! 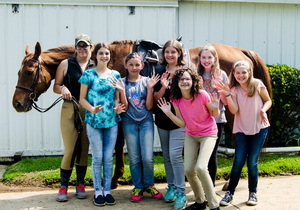 North Crest birthday parties give your child hands-on experience with horses. You may supply party food, cake and beverages of your choice. Call or email for details. Parties last 2 hours. Any additional time over the 2 hour time limit is charged at $50.00/half hour. Cost of party is $250.00 payable before event. Cash or check, please. Minimum age to participate is 6 years old. Price includes up to 10 children. For any additional children, the charge is $25.00/child. 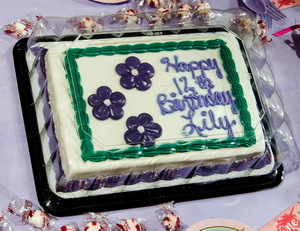 Limit of up to 12 children per party. Parents may supply party food, cake and beverages as well as serving supplies. North Crest will provide table and chairs, tent or heated room for seating and prizes. All children need to wear long pants and closed-toe shoes. No shorts or sandals. Parents are required to wear closed-toe shoes as well. No sandals or flip-flops. All parents and children are required to sign a release form prior to the start of party. Those not signing said release will not be allowed to attend. Photography and video are permitted throughout the event. No flash please! Rules regarding safety around horses are reviewed while still inside of tent or heated room. 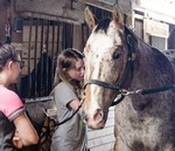 Children get a tour of the barn and introduction to the horse they will be riding. Horses are brought into the arena and each child is lead around the arena by a handler. The Birthday Child goes first! 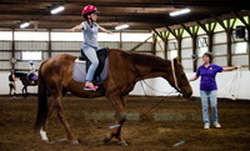 Children are required to wear horse safety helmets which are provided by North Crest. The children waiting to ride will be entertained with a ''horsey craft'' or game. The horse(s) are untacked (saddle and bridle removed) and children are able to feed them carrots or apples. We then play ''Pin the Tail on the Horse'' game (with a fake horse) and each child gets a prize. The birthday child gets the Blue ribbon and everyone gets to draw from the prize bag. Other ''horsey games'' will be played as time allows. Parents can bring in a craft for children to work on as well. Each child will be provided with a small ''horsey goody'' bag before leaving. Parents will be required to have North Crest Release Forms signed by each child's parents before the party. We give the release forms to the parent having the party ahead of time. Most parents send this release form out in the invitation. Release forms must be signed for all children before they will be able to participate in any North Crest activities. 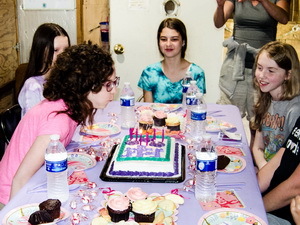 Some parents prefer to have the cake/food and presents done ahead of time at their homes before coming to North Crest. The option is open.